Create layers, dribbles, washes, and fine lines with GRAPHIK Line Painters. 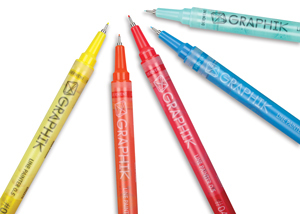 They issue fluid, opaque pigment ink from a 0.5 mm Japanese nib. Use a brush to blend and create effects. The permanent waterbased ink is solvent-free. ® Derwent is a registered trademark.